This private, well appointed home is built in 2008 in secluded country neighborhood, just outside of Benton City limits, on a well-kept private road. The home is set upon 13.5 land and offers timber frame great room with cedar-lined vaulted ceiling and lots of windows to enjoy the great view. The master bedroom brings the ultimate escape with a comfortable king bed, vaulted ceiling and fan, large walk-in closet, and radiant heated floor in the bathroom and custom stone floor shower. A large, bright, open kitchen with 36 inch-6 burner Dacor gas range, 2nd Dacor wall oven & microwave, and a Viking Fridge. Large island that can sit 7 people comfortably, and a formal dining table. Master suite, office/den/spare bedroom and laundry on main floor. Lower level with stained concrete, radiant heated floors, 2 large bedrooms, and 2 bathrooms along with a family room with TV and sofa/chairs. A 1000 sf bonus room with a top of the line queen pull out bed complete with a tempurpedic mattress to ensure a good nights sleep. The room also has a media center complete with a 60 inch HD tv. It's an ultimate get away for wine lovers with a view of Red Mountain, Badger Mountain, and Horse Heaven Hills. 10 minutes to all the great Red Mountain wineries and award winning restaurants in Richland. 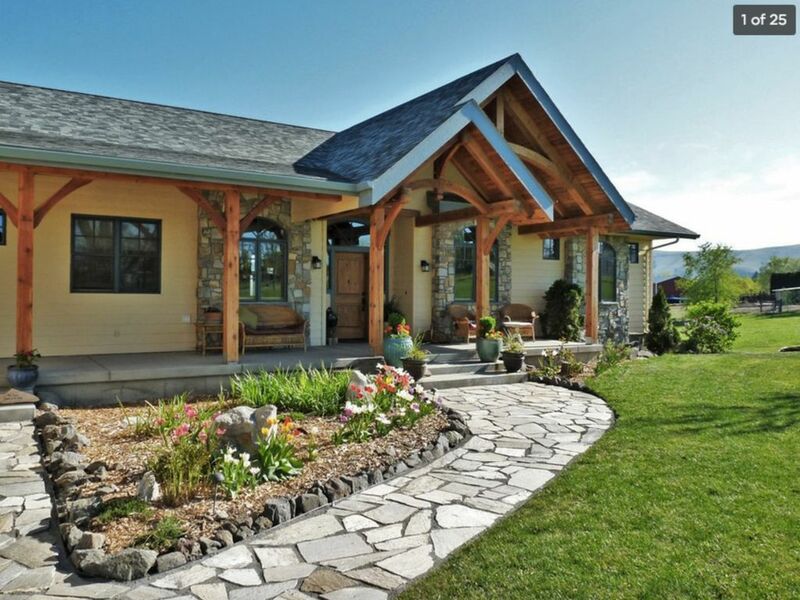 This home is perfect for those wanting to escape the city to the quiet countryside of Eastern Washington. We welcome couples and children to stay at our home and hope you enjoy it as much as our family does. Couple things to note, please no pets/animals or events/parties to be held. In Addition, our home is out in the country, internet/wireless is available but it can be sporadic, depending on where you are at the house. We are originally from the bay area and moved to Seattle about 3 years ago. We love wine so when we traveled to Eastern Washington and discovered Red Mountain, we fell in love instantaneously. We bought this home so we have a place to stay when we go wine tasting in Eastern Washington, and would love to share our home with other wine lovers! There's a gas fireplace on the main level that the guests are welcome to turn on, the wood fireplace on the lower level is not for use. Dining room sits 6, and the island sit 7 people. We have some board games in the cabinet of the family room on the lower level. Guests are welcome to use them. Two Xbox One's. Please feel free to bring you games. My family and I loved your beautiful home for our son's wedding weekend. All of the rooms were spacious and lovely and the outdoor grounds were gorgeous. There was an abundance of space for all of us to congregate for meals and socialization while still allowing others to sleep-in or go to bed early. The views from the outdoor patio on Friday and Saturday morning were stunning and a perfect place to relax and take in some warm sunshine before our days got started. All of the close-by boutique wineries created a perfect daytime activity for all of my family to engage in preceding the evening wedding festivities on Friday and Saturday. I appreciated your hospitality and quick-to-respond correspondence throughout the reservation process. You were a great host and our stay at your amazing home in conjunction with the wedding made for a very memorable weekend for all of my family! Thanks for everything and we hope to reside at you lovely home again in the future. Thank you for your kind words. We are so glad to hear you had a great time at our house. You are welcome to stay with us anytime! This home was especially clean, and the welcome package included great detail about what was both provided for us and what was expected of us. There were a couple of small glitches beyond our host's control, but she remained in close contact with us and made sure our needs were taken care of immediately to remedy the problems. The property was beautiful and the view from the hills was especial pastoral. Finally, we were in the area for golf and wine tasting. Golf was no more than 20-25 minutes away, and several good wineries were within 10 easy minutes from the property. The property is ideal for a couple of families with children, but set up less conveniently for four adult couples because of unusual sleeping arrangements. This is a beautiful home on a great piece of property. While we didn't spend too much time at the house, there is plenty of room to spread out and also play lawn games. The views in the distance are incredible. The kitchen is large and great for big group gatherings. Thanks for the review Stephanie! Loved the beautiful layout of the house. The open plan was so wonderful. The house felt like home. All in all a perfect time was had by all. Thanks Margaret. So happy to hear you had a great stay with us! This house, although outside of the Tri-Citiies proper is wonderful. The huge kitchen with large island allows for people to gather while others cook. Bedrooms are large with convenient bathrooms. It snowed while we were there and watching the snow fall through the large windows was magical.